Wrap each unpeeled beet in foil. Place directly on an oven rack and bake for 45 minutes. Remove from oven and carefully unwrap foil to cool. Once slightly cooled run each one under cold water, gently rubbing the skin to remove it. Slice beets into ½ inch rounds. Set aside. For the dressing, place all ingredients in a high-speed blender. Blend until smooth and creamy, about 1 minute. Set aside. 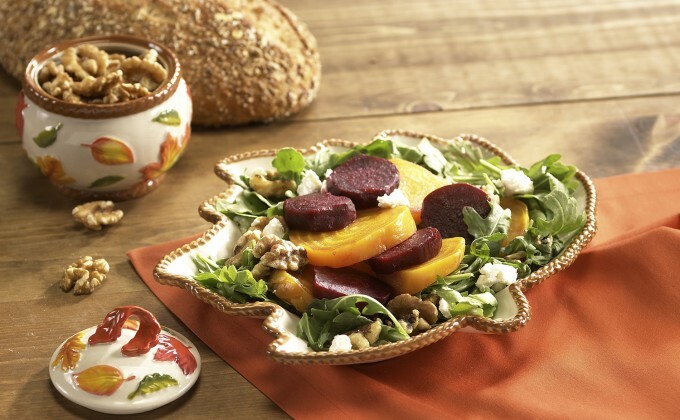 To assemble salad, place spring mix lettuce in your temp-tations® nested leaf plate. Top with sliced beets, goat cheese and walnuts.